Christmas is my favorite time of the year. I just get so happy listening to KOST and my Christmas Pandora station, seriously people try Christmas music when you are in a bad mood. Mind blown. Anyway...this weekend there are a lot of fun activities to check out. 1. Chill at Queen Mary opened up right before Thanksgiving, but its definitely something you have to see. There is an ice skating rink, ice tubing, the Ice Kingdom and Santa. The Ice Kingdom is the thing to go for. They hand carve statutes from over two million pounds of ice to portray the story of The Nutcracker, this year. You have to bundle up, which is nice for us SoCal kids who don't get much cold weather (thank god). 2. 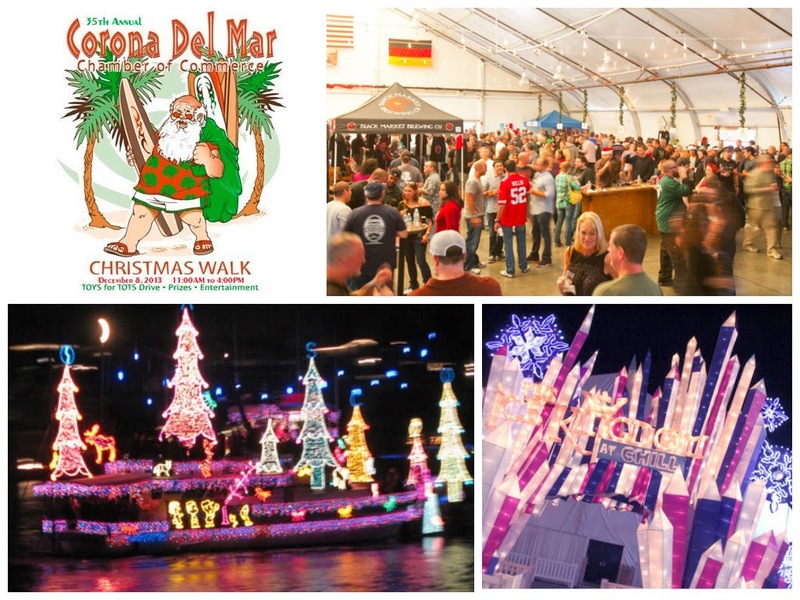 Corona Del Mar Christmas Walk is this Sunday. A fun festival of crafts, beer tents, and music is sure to make for a great Sunday Funday. The beer garden has an entry fee and then you get tickets for each beer you want. After walking around the different tables full of fun gift ideas, take your friends and go out to dinner at Sidedoor or walk to the cliffs to see the sunset. 3. OC Brew Ho Ho is on Saturday and is the largest Holiday Ale Celebration. While I have never attended, this seems pretty freaking cool. The 2nd annual Brew Ho Ho hosts 50 different craft beers and food vendors. For $55 you get four hours of unlimited tastings while you walk around other vendors to do some holiday shopping. Located at the Phoenix Club, make sure you have a designated driver. 4. Dana Point Wharf is having their annual boat parade this weekend. Private boats are decorated for your viewing pleasure and cruise around the harbor. Go down to the wharf yourself or hop aboard one of the city's chartered boats to get up close and personal. Make sure you keep warm with some hot chocolate because its going to be a "cold" weekend out on the water! as I never leave Dana Point unless I have to ... I know which event I will attend this weekend! !